Prathyusha Institute of Technology And Management, Chennai popularly known as PITAM is the brain child of the well-known industrialist and philanthropist Shri. P. Raja Rao, the founder Chairman of the Governing Board of the College. PITAM is a self-financed Telugu Minority Institution approved by AICTE, affiliated to Anna University, accredited by NBA and a recipient of ISO certification. The college offers 7 UG courses and 7 PG Courses with an annual intake of 1068 students. The overall students strength of the college is 3000. PITAM is located just 30 KMs away from Chennai Central Station on the Poonamalle - Tiruvallur road at a hamlet called Aranvoyalkuppam in spacious serene and invigorating surroundings, far from the maddening crowd and the hustle and bustle of the urban locale. The lush green campus provides an ideal and congenial atmosphere to pursue education without any external distractions like noise, sound and air pollution. All you need to do is to fuel your brain to ideate the ideas that never existed. The planet is all yours and come up with a spark of innovation to improve the lives around you. The stage has been set to listen to your words. Hope you fulfil the expectation in the form of PAPER PRESENTATION. · Prior registration is compulsory. · Two Hard copies (MUST) and 1 Soft Copy (CD/E-Mail). · Paper should be in IEEE format. · Prior Registration is must. · 8 Minutes for Presentation & 2 minutes for queries. 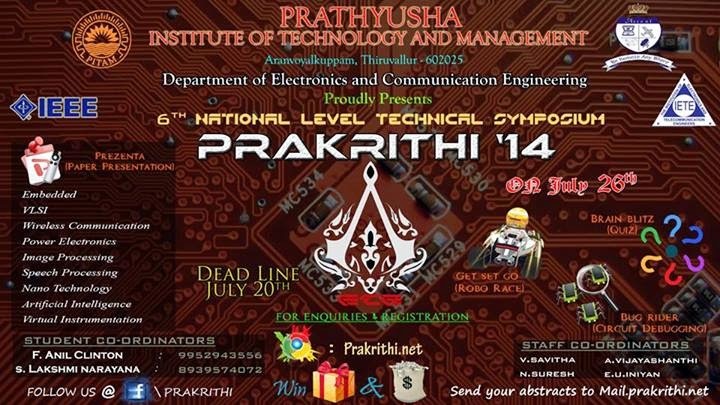 · Other Collage participants are requested to send their abstracts to our EMAIL-ID : contact@prakrithi.net. · Last Date: 20th JULY 2014. 1. Maximum dimensions of robo should be 25*25*(in cm). 2. Maximum 6 tyres robo are allowed. 3. Both wired and wireless robo are allowed but flying robots are not allowed. 4. Wire pulling is prohibited. 5. Maximum 4 members are allowed in a team. 6. Maximum 3 members are allowed in arena during event. 7. Maximum 3 hand touches are allowed to each team during event. 1. Use of slang tone. 3. Failing to meet dimensional conditions. 4. Disobey of rules and regulations. Are you good at designing and implementing radical circuits? We provide you an electrifying atmosphere to prove your mettle. Rack your brains, crack the problem, design the perfect circuit and watch it work in no time. Amplify your strength and attenuate your weakness. Think out of the box, open circuit your creativity and short circuit the lines between analog and digital circuits with the tools of theoretical classiness. Let the Kirchoffs, Thevenins and Nortons within you wake up and rig up innovative circuits. Filter your ideas and transform them into a useful circuit. 2. Prior registration is compulsory. 3. Selection Process through Preliminary Test. 4. Circuit will be given and bug should be spotted. 5. Spotting of bug with SPICE TUTORIAL will also be available. 6. 30 Minutes for spotting the bug. What you know is important but what you know better than others is more important. We cover everything tagged with computing and information technology. Squeeze your brains to release the right extract at the right moment. It is high time for QUIZZING and let us see who wins the brain wrestling. · Only 3 members are allowed per team. · Use of mobile phones is not allowed. If any malpractice is found, then the team will be disqualified. · 1st round will be a written test based on the Current Affairs and Recent Technology. · Top 10 teams will qualified for 2nd round and Rules will declare on-spot. · 2nd round will be figure it. · 3rd round will be identification of personalities of various fields. · Final round will be connections which is based on identifying images (technical). · The decision of the Judges will be final.